Jonny Dicke, left to right, secretary of St. Marys Council No. 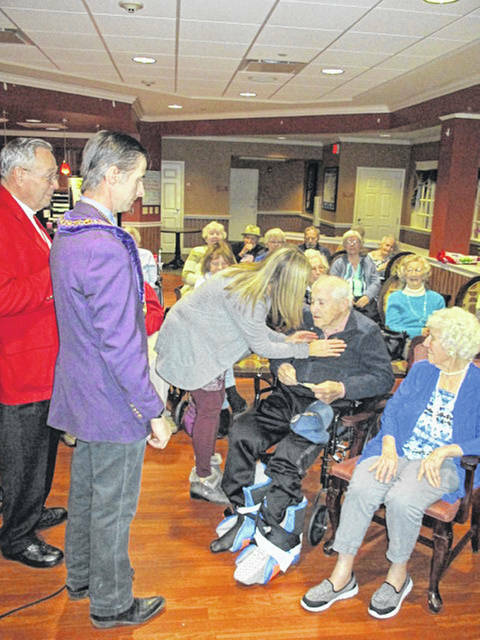 81 Royal Arch Masons, and Mike Terry, grand conductor of the Grand Council of Ohio Royal and Select Masons, watch as Beni Menker, of St. Marys, pins an award on her father, Benjamin Frasure, of New Bremen, at Elmwood Assisted Living in New Bremen, Friday, Jan. 11. At right is Frasure’s wife of 75 years, Patsy. Frasure was honored for 60 years of Masonic membership. NEW BREMEN — Benjamin Frasure, of New Bremen, was surprised at Elmwood Assisted Living, Jan. 11, when family members and fellow Masons showed up to honor him. Frasure was awarded pins for 60 years of Masonic participation. Mike Terry, grand conductor of the Grand Council, presented Frasure with pins from the Grand Council of Royal and Select Masons of Ohio and the Grand Chapter of Royal Arch Masons. Bruce Shinaberry presented pins on behalf of the St. Marys Chapter No. 51 Royal Arch Masons and the St. Marys Council No. 81 Royal and Select Masons. Frasure joined the York Rite organizations in 1958. In October 1958, he received the Mark Master degree, presided in a lodge of past masters, and received the Most Excellent Master degree and Sublime Degree of Royal Arch. In November 1958, Frasure received the Royal Master degree. In April 1959, he was awarded the Select Master and Super Excellent Master degrees. Frasure’s daughters and grandsons pinned him with the awards, Jan. 11.
https://www.sidneydailynews.com/wp-content/uploads/sites/47/2019/01/web1_Masonic-honors-1.jpgJonny Dicke, left to right, secretary of St. Marys Council No. 81 Royal Arch Masons, and Mike Terry, grand conductor of the Grand Council of Ohio Royal and Select Masons, watch as Beni Menker, of St. Marys, pins an award on her father, Benjamin Frasure, of New Bremen, at Elmwood Assisted Living in New Bremen, Friday, Jan. 11. At right is Frasure’s wife of 75 years, Patsy. Frasure was honored for 60 years of Masonic membership.